If you’re still trying to come up with a Halloween costume that’s equal parts classy English royal and funny, look no further because dressing up in a pregnant Kate Middleton Halloween costume is the way to go. The Duchess of Cambridge has one of the most enviable senses of style on the planet, whether she's got a bun in the over or not. When she was pregnant last year with Prince George, Middleton showed up to each and every event in a sophisticated ensemble that emphasized how 1.) perfect she is, and 2.) that even at nine months pregnant she looked better than I ever will. (For the reason why see #1). Think you can pull off her look this October? Duh. Of course you can. There’s no word yet on whether Prince George will be getting a baby brother or sister, but it has been reported that the new addition to the fam is making Middleton more than a little queasy. If you want to carry around a barf bucket to make sure people are aware of the dramatic lengths you go to portray her, feel free. (You can always fill it with candy! Hooray!). Otherwise, the basics to looking like a knocked-up Kate Middleton are below. Since it appears that Kate Middleton doesn't go anywhere without a fan to gloriously blow her long, artfully tousled brunette waves over her perfect shoulders, you're going to need a bangin' brown wig (unless you already have hair like hers, in which case carry on, and also NOT FAIR). To give the hair some trademark Middleton flair, use a large barrel curling iron to curl the ends and give it some volume. If you want to be a little more princess-y, do a half-up, half-down style. Peasants will be bowing down in no time. You can't have a title like "The Duchess of Cambridge" and not rock some incredible fascinators. The easiest way to DIY one if you don't have an elaborate hat just lying around your apartment is to start off with a headband, and work up (literally) from there. Glue on a group of large flowers, maybe some feathers, or since it's Halloween, make a bouquet of pumpkins and candy corn. It's all about being ~*fEsTiVe*~ right? 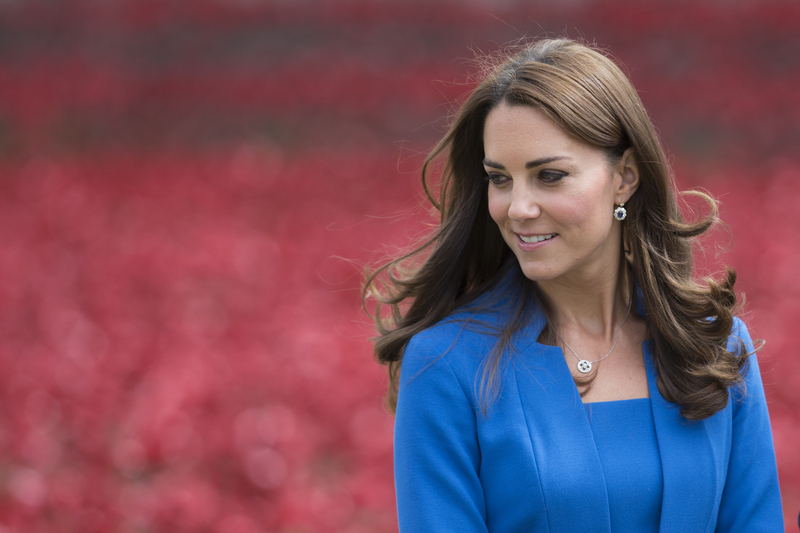 Kate isn't exactly known for gracing her loyal subjects with a full face of makeup. Instead she opts for simple beauty looks, accentuated by her standard black eyeliner. Get some liquid liner to make it really bold, and you'll be good to go! Step 4: Prepare the baby bump! There's a new little prince or princess on their way, and they're about to be the funniest part of your costume. There are a few options for creating a fake pregnant belly, but if you want to go FULL ON preggo, you can use a helmet. Whether it's for biking or football, a standard size or your little cousin's one from peewee, a helmet will create the perfect faux bump, and they're sold for as low as $20. Attach it to your middle with an athletic wrap or bandage to keep the bun in your oven from making a surprise arrival during any Halloween outings. Middleton loves casual printed day dresses as much as she loves dressing things up with a blazer, so either are a safe choice. If you want to look more like a duchess, however, hit up a thrift store for some fancy (but cheap!) dresses that will help you look like a true royal. Remember to go up a size to accommodate your bump! Step 6: Don't forget the rest of your royal fam! If you have a boyfriend (or regular friend!) who's down to be the Will to your Kate, tell him to throw on a crown and play the part. 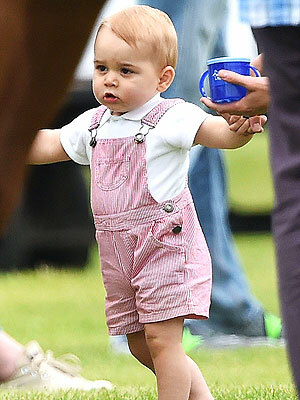 You can also carry a baby doll around to represent Prince George (adorable overalls optional).